Attractions in York, North Yorkshire. 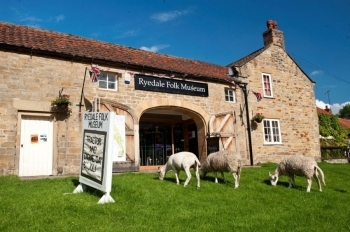 Ryedale folk museum, a great day out in Yorkshire for the whole family. Wander into 16th, 18th and 19th century thatched cottages, Iron Age roundhouse or just explore the many attractions of Ryedale Folk Museum’s 6 acre site. Visit workshops of traditional crafts, marvel at the inventiveness of your forebears and see how they worked and lived. A great day out for everyone! We have special events all year round, see our website for details. On Monday 22nd April 2019 the sun will rise at 05:47 and will set at 20:19. It will be a mild day, with temperatures reaching around 19.2°C. Today is expected to be a dry day, with a very low chance of rain. It will be quite a breezy day, with a maximum expected wind speed of 18mph. On Tuesday 23rd April 2019 the sun will rise at 05:44 and will set at 20:21. It will be a mild day, with temperatures reaching around 15.1°C. Today is expected to be a dry day, with a very low chance of rain. It will be quite a breezy day, with a maximum expected wind speed of 18mph. On Wednesday 24th April 2019 the sun will rise at 05:42 and will set at 20:23. It will be a mild day, with temperatures reaching around 14.8°C. A light shower is possible, 1mm of rainfall is possible today. It will be quite a breezy day, with a maximum expected wind speed of 19mph. On Thursday 25th April 2019 the sun will rise at 05:40 and will set at 20:25. It will be a mild day, with temperatures reaching around 13.1°C. A few showers are expected, 3mm of rainfall is possible today. It could be quite a gusty day today, with a maximum expected wind speed of 24mph. On Friday 26th April 2019 the sun will rise at 05:38 and will set at 20:27. It will be a mild day, with temperatures reaching around 14.7°C. A light shower is possible, 2mm of rainfall is possible today. It could be quite a gusty day today, with a maximum expected wind speed of 24mph. On Saturday 27th April 2019 the sun will rise at 05:35 and will set at 20:29. It will be a mild day, with temperatures reaching around 14°C. A light shower is possible, 2mm of rainfall is possible today. It will be quite a breezy day, with a maximum expected wind speed of 28mph. On Sunday 28th April 2019 the sun will rise at 05:33 and will set at 20:31. It will be a mild day, with temperatures reaching around 6.2°C. Today is expected to be a dry day, with a very low chance of rain. It will be quite a breezy day, with a maximum expected wind speed of 26mph. Ryedale folk museum, a great day out in Yorkshire for the whole family. Wander into 16th, 18th and 19th century thatched cottages, Iron Age roundhouse or just explore the many attractions of Ryedale Folk Museum’s 6 acre site. Visit workshops of traditional crafts, marvel at the inventiveness of your forebears and see how they worked and lived. A great day out for everyone! We have special events all year round, see our website for details.